*Starting salary and grade will be determined on the basis of qualifications and experience, and/or salary history. All Ordinarily Resident (Or) Applicants (See Definitions) Must Have The Required Work And/Or Residency Permits to Be Eligible for Consideration. 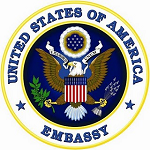 The U.S. Embassy in New Delhi is seeking an individual for the position of Telephone/Radio Technician in the Information Resources Management Office. NOTE: Applicants who had applied in response to this vacancy announcement dated August 13, 2010 and October 14, 2010 need not re-apply as their applications will be considered.